Think back to when you were two years old. Think HARD. Anything? If you’re like most people, you’re probably drawing a blank. Across cultures, adults can’t seem to recall any events that occurred in the first 2-3 years of their lives; memories between 3-7 years of age are often filled with holes or a healthy mixture of reality and fantasy. This phenomenon, first dubbed by Sigmund Freud in 1900 as “infantile amnesia,” has left scientists scratching their heads for decades. Early hypotheses supposed that young children didn’t have a sense of self and thus couldn’t form memories about themselves. Eavesdropping on a toddler’s “this was my day” crib-mumblings would quickly convince you otherwise. In a landmark experiment performed in the 1970s, Dr. Byron Campbell found that guinea pigs, which are born with relatively mature brains, retain their infant memories of a passive avoidance task over a 2-week retention period. In stark contrast, similarly aged young rats, which go through extensive postnatal brain maturation, could not retain the memory when trained and tested with the same protocol, suggesting that ongoing brain development in infancy is to blame. Evidence is pointing at adult neurogenesis as the specific culprit. After birth, two areas of our brain continually generate new neurons, rapidly after birth then gradually declining as we age. One area with abundant neurogenesis is the dentate gyrus in the hippocampusStructure in temporal lobe that has many functions but is es..., a brain region important for learning and memory. These youngster neurons are highly excitable and eager to encode memories – and they indeed do. In adult rodents, artificially increasing neurogenesis before learning helps the brain retain and differentiate between two very similar experiences; in other words, it helps them remember better. But more computational power is not always a good thing. When new neurons integrate into an existing circuit, they profoundly “shake up” the wiring and excitability of hippocampal networks, ultimately leading to the disruption of old memories stored in synaptic connections. Is this what leads to infantile amnesia? Researchers from the University of Toronto explored this idea with an elegant set of experiments. First, they trained a group of adult mice to find a hidden platform in a giant pool of murky water. Once the mice learned the task, researchers jacked up their neurogenesis by 2-3 fold, essentially turning the rate of neurogenesis “infantile.” When tested later, mice with increased neurogenesis performed way worse than their non-manipulated peers. Endorsing adults with a “baby”-like neurogenesis deteriorated an otherwise-stable memory! Researchers then tackled the hypothesis from the other end: they slowed down neurogenesis in baby mice, thus mimicking an adult state. They selectively killed many of the newborn neurons using highly selective pharmaceutical manipulation. They then trained these mice, along with normal baby controls, to associate a box with an electrical shock. Four weeks later, after sufficient time for new neurons to “infiltrate” into existing networks, researchers put the mice back into the box with an electric shock. Normal baby mice skittered around undisturbed; they had forgotten that the box was a dangerous place! However, baby mice with “old-man neurogenesis” froze in fear. They, blessed with lower rates of neurogenesis, became immune to infantile amnesia and retained the memory just fine. These are among the first data to support adult neurogenesis as a factor driving babies to forget. Many questions remain. Does the magnitude of increased neurogenesis determine how much a baby forgets? Are non-hippocampal memories disrupted by neurogenesis? Some scientists propose that memories initially dependent on the hippocampus eventually “transfer” to the cortex for “permanent storage” – are these memories saved from forgetting? And, on the grand scheme of things, are we unfairly robbed of our earliest memories? Or is adult neurogenesis doing us a favor by uncluttering the baby brain, thus allowing new and more important memories to be stored? 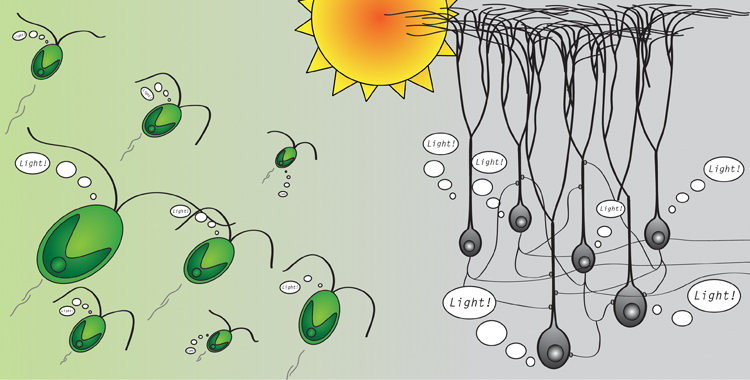 What do single cell green algae have to do with the state of the art of neuroscience?